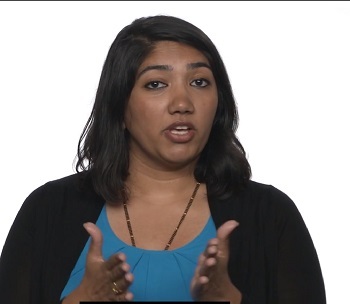 Pravrutha Raman has a unique challenge—to present her complex dissertation research on gene silencing in just three minutes for an international audience. Raman, a doctoral candidate in biological sciences, is competing for the People’s Choice and Judge’s First Prize, in the International 3 Minute Thesis Contest. She examines this issue by silencing genes in a tiny worm, the species known as C. elegans. She is now studying which of these genetic changes carry on among multiple generations of descendants, and what factors make genes susceptible or resistant to being silenced in future generations of offspring. The contest, sponsored by Universitas 21, an international network of research universities, challenges doctoral students to communicate the significance of their research in just three minutes. Raman advanced to the international contest after winning the university’s competition, sponsored by the Graduate School, last spring. She is competing against 18 other finalists from 12 countries for three prizes: Judges’ First Place, Judges’ Highly Commended, and People’s Choice. UMD has a track record of success in the international contest, winning awards in 2014, 2015, and 2017. You can view and vote for Raman’s video online here; People’s Choice voting runs until October 22.